I’m trying to move on from all this Jeremy Lin craziness, but I was intrigued by Ian Begley’s interview with Lin the day after the Knicks decided not to match Houston’s offer. What I expected was the usual talk when a beloved athlete leaves, “I love the fans” and “I wanted to play here for the rest of my career”… Except, what I read made me look differently at what Lin might have been thinking as talks started to heated up. 2 things stand out with what Lin said; “my main goal in free agency was to go to a team that had plans for me and wanted me”. All Lin talks about is how he loved the NY fans and that he preferred playing in NYC, so if you’re not playing in the preferred city you wanted to play in… What exactly is he so relieved about? After all the Linsanity and winning an Espy, could it be that Lin was feeling the pressure? I mean at the end of the day this is still NYC, and the media here builds you up just so they can knock you down. And with the Knicks fan base resting all their hopes and dreams on the shoulders of Lin, may be just may be basketball would not be as fun as he thought he could be. Yes the Knicks have Amare and Melo, but it was Lin who had the Garden rocking like no other time during that EPIC 8 game winning streak. There was no question Lin was going to sign with someone, so I just don’t get the relief he felt. Of course I could be over analyzing this, smh. How many more days until NFL Kickoff??? After an amazing 26 game stretch that was covered by both the national and international media; the era of Linsanity in NYC is officially over. The contract Houston offered was “Ridiculous”. Like every other Knicks’ fan I enjoyed Linsanity, it was one of the highlights of last season. But during those 26 games there were also troubling signs, no defense, and turnovers. 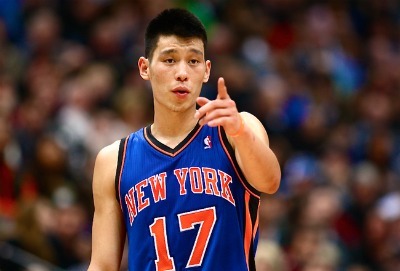 The pace of Linsanity slowed and many will blame the return of Melo but at the same time the NBA was figuring out Lin. Then there is also Lin electing not to play in the playoffs when he stated he was at 85%. The Knicks were desperate for point guard help after Shumpert and Baron Davis were injured, some would say if Lin wanted the Knicks to take a chance on by matching the $25 million dollar contract… May be he should have when he decided to sit out the playoffs. As I stated earlier this is far from over, I would not be surprised if one of the major NYC papers run a weekly comparison of what Lin is doing versus what the Knicks are doing when the season starts. Dear God I hope that doesn’t happen…. We may not know at this point if Lin will succeed in Houston or if the Knicks will be a winning team next season, but one this is for sure. Lin’s 1st game back at the Garden will be an EVENT!! !